Can you see that it's a race car? After all, this is NASCAR country. There were checkpoints at the front tire, door, roof, and hood with a hole punch at each one, if you collect all 4 punches you get a prize. Griff was enamored with "finding" corn and husking it. He kept wanting to stop and search for corn every few steps. At some point I had to convince him that we didn't really need to *find* the corn because really, we were completely surrounded with corn. Corn on every stalk, corn all over the ground. It wasn't really lost or hidden. You can tell my logic worked because I'm home now writing to you instead of husking our 9,395th ear of corn, 10 yards into the maze. Poor Reese was just melting down from the time we went into the maze, and begging me "milks milks milks" so I finally gave in and plopped on the ground. After that Dan took him and sang to him and he passed out HARD, slept through most of the rest of the maze. Dan got the privilege of carrying the 10-ton sleeping baby. Fortunately for him, it only took us about 1/2 hour to finish the maze because Dan figured out that the main path is marked with orange twist ties, so all we had to do was find the checkpoints using maps in the maze. 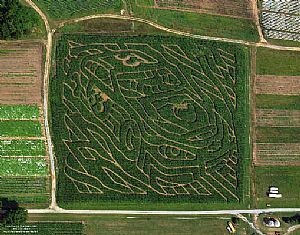 And despite advice from several families we met in the maze, we did NOT take the cheater paths through the corn, we took the real paths. What fun is a maze if you're not actually going to do it right? Plus, people, I've got a 3-year-old to set an example for, ok? Griff claimed his prize. My prize was trying to explain how to play a kazoo. It's harder than it sounds. Reese perked up for the hayride, mostly because it had his favorite thing in the world: truck truck truck truck truck truck truck. Tractor is apparently pronounced "trucktruck". The tractor took us to his second favorite thing in the world, pumpkins, pronounced "puppies!" Now, some photos for you. I would have dispersed them throughout the narration but they look cool grouped together. Please notice that Dan is getting much better at taking unsolicited photos of me. Finally, proof that I exist!